Something is afoot in Tyrannia! You should probably log in or sign up to help figure things out. You Need A Tyrannian Scanoscope! You have a Tyrannian Scanoscope, but it needs to be activated for you to use it. Please visit your inventory. You wipe your brow and sling your new treasure into your inventory. 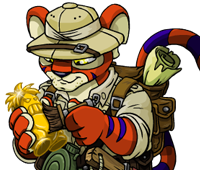 Are you sure you want to use your Tyrannian Scanoscope to scan this patch of dirt? A short distance from the main dig site, a team of scientists have set up a treasure-finding station. Use a scanoscope to detect a new item every day. One per day, please; we don't want to export Tyrannia's national treasures too quickly.